Welcome to Almaty, Kazakhstan! I invite you in the very center on the Eurasian continent. Here you can see the name Almaty on the new map or Alma-Ata on the old one ( latitude 43° North, longitude 77° East). It's a biggest city of Kazakhstan the former Soviet republic which became independent in December 1991. In contrast to the majority of hot south cities presented here in Virtourist Alma-Ata has no sunny beaches, palm trees, and crowds of tourists. The exceptional position of the city forms its character. Situated near mountains at about 1000 m above the sea level with the soft climate, having good natural conditions for gardening, Alma-Ata is surrounded with apple gardens. Many streets run straight to the gardens. Even the name Almaty was given to the city because of apples. 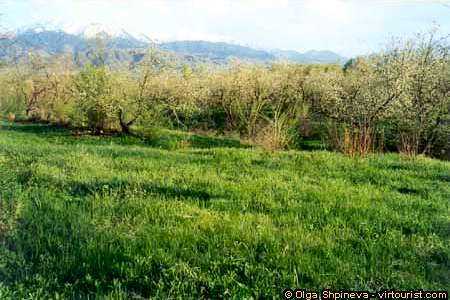 ("Alma" means "apple" in Kazak) You can see gardens everywhere. Few minutes driving from the center and you are among apple trees. Look here ... It's a beautiful place at any time. Silence and windless, sunny weather and nice mountains view make you a good mood. No one can imagine we are a few meters from one of the main streets of the city in the upper region.